Friday May 11th 1923 It rained all day. Jack [Sterritt?] papered my room before noon. I worked nearly all day about the house. I wrote Laura before supper time. William & Mary came this PM. 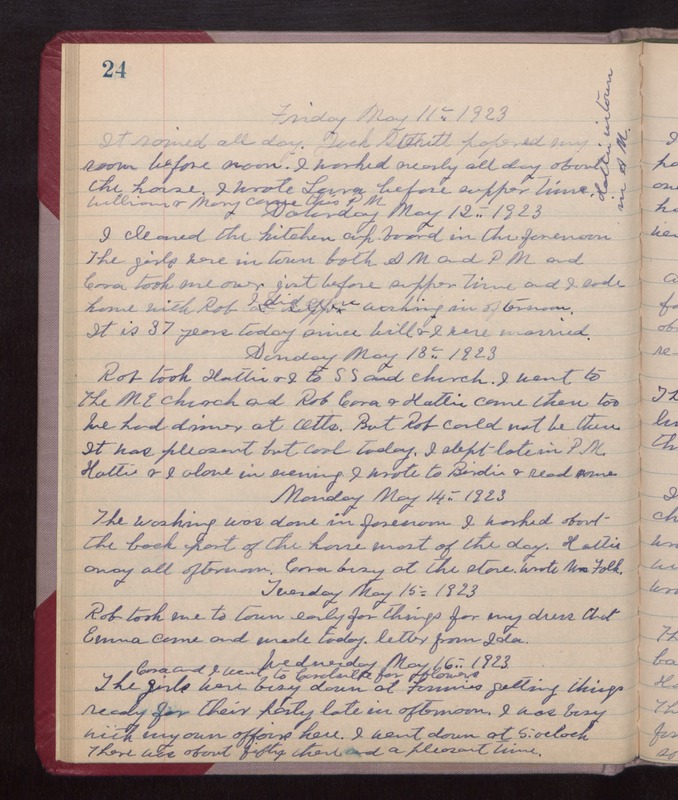 Hattie in town in AM Saturday May 12th 1923 I cleaned the kitchen cup-board in the forenoon. The girls were in town both AM and PM and Cora took me over just before supper time and I rode home with Rob. I did extra washing in afternoon. It is 37 years today since Will & I were married. Sunday May 13th 1923 Rob took Hattie & I to S S and church. I went to The M E Church and Rob Cora & Hattie came there too. We had dinner at Otts. But Rob could not be there. It was pleasant but cool today. I slept late in PM Hattie & I alone in evening. I wrote to Birdie & read some. Monday May 14th 1923 The washing was done in forenoon. I worked about the back part of the house most of the day. Hattie away all afternoon. Cora busy at the store. Wrote Mrs Falk. Tuesday May 15th 1923 Rob took me to town early for things for my dress that Emma came and made today. Letter from Ida. Wednesday May 16th 1923 Cora & I went to Coralville for flowers. The girls were busy down at Fannies getting things ready for their party late in afternoon. I was busy with my own affairs here. I went down at 5 oclock. There was about fifty there and a pleasant time.